DONETSK, Ukraine -- The airport here in this battle-scarred region of eastern Ukraine seems oblivious to the cease-fire brokered six weeks ago. Pro-Russian rebel commander Cmdr. 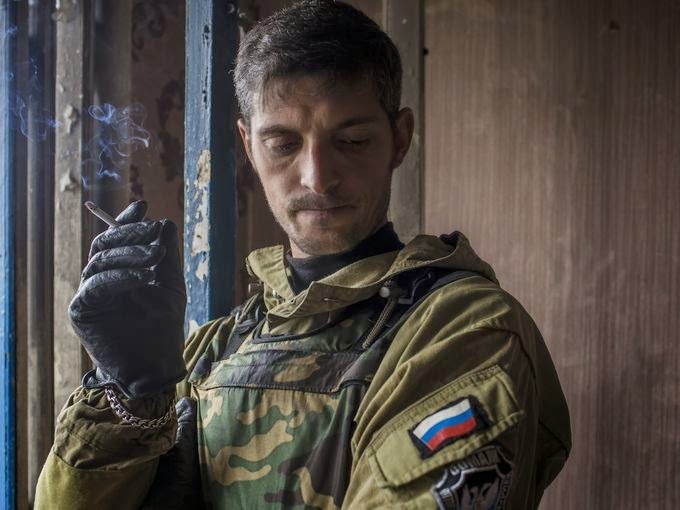 Mikhael "Givi" Sergeyevich Tolstikh smokes while coordinating rebels from inside an apartment building. The battles between Russian-backed rebels and Ukrainian forces rage on at a place that has taken on greater significance in Ukraine with each passing day. It's strategically important, to be sure, but interviews with the rebels and Ukrainian forces waging this war make it clear that Donetsk is about much more. Cmdr. Mikhael "Givi" Sergeyevich Tolstikh, a rebel commander leading the fight around the Donetsk airport, says his forces will "hold the line" against Ukrainian forces whom he claimed were preparing an assault to retake the facility. "My main aim is to hold the defense of the airport, not to attack, just hold the line," Tolstikh said in an interview with USA TODAY on Friday at the pockmarked apartment building his forces are using as a command post. It's about a mile from the airport's main terminal. The building sits in a residential neighborhood known as Kievski, surrounded by single-family homes and a playground now strewn with shards of glass, rubble, spent artillery shell casings and boxes of ammunition. Pro-Russian rebels have been fighting Ukrainian forces here since May 26, when Ukrainian commandos retook control of the airport with support from fighter jets and helicopter gunships. Those forces have since gained legendary status in the rest of Ukraine, where they're known as "Cyborgs." The moniker comes from an intercepted rebel radio transmission in which a fighter spoke of their perseverance despite repeated attacks. The rebel leadership signed a cease-fire agreement with Ukraine on Sept. 5 in the Belarussian capital, Minsk, but the sound of shells landing near the rebel command post and the boom of outgoing artillery made clear that no cease-fire was being observed at this location. Ukrainian officials extol their fighters at the airport as besieged heroes preventing a staging point for future attacks that would threaten the rest of the country. Tolstikh says the airport has gained symbolic importance to Ukraine because fighting there has lasted so long. The rebels have retaken the airport, he said, but Ukrainian forces continue to fire howitzer cannons, mortars and tanks from constantly changing positions in a thicket nearby. He also said Ukraine has been positioning hundreds of troops in surrounding cities — 857 to Peskil and 460 to Avdeevka — in preparation for an assault to retake the facility. The Ukrainian government says its forces continue to hold the airport, or part of it. Tostikh's claims about a pending government assault could not be verified. Despite Ukrainian reports of multiple rebel attempts to take the airport, Tostikh said that since the cease-fire deal, his forces have only responded to government shelling in kind. "We're defending this place not because of the importance of the airport but because people here want to live in peace, without shelling," he said. Olexander Motsyk, Ukraine's ambassador to Washington, said the airport is of strategic importance to the rebels, whom he said would bring combat aircraft to Donetsk if they could. "They (rebels) hope Russia will give them aircraft so they can have an air force there," Motsyk said. "We observe the cease-fire and do not shell positions of rebel forces except when they fire on our positions." Yuriy Lutsenko, the president of Ukrainian President Petro Poroshenko's parliamentary bloc, said rebels could use the airport and the railway hub in nearby Debaltseve "to secure complete control of the region," according to a report by Kiev media outlet Ukraine Today. Debaltseve is a railway hub connecting the rebel strongholds of Luhansk and Donetsk, and the airport could serve as a base for future offensive operations and an air bridge to Russia, Lutsenko said. Asked about a potential rebel air force and future plans, Tolstikh laughed. "Russian planes and aircraft can land here and they will, for sure," he said. Right now, the control tower is in ruins and there's no ground support, but the railroad has already started bringing non-military goods to Donetsk, he said. So "the worries of the Ukrainian government are right," he said. "Our task for now is to fight back for territory that used to be under our control." Despite the shelling, which can be heard as distant booms most afternoons in downtown Donetsk, and the destruction all around them, Tolstikh and his men appeared in good morale as they smoked cigarettes and joked. "Everything is under control, so we're not worried," he said. As he spoke, a small blue van traveled from the outpost to the airport with food and supplies for rebel troops there. Outside, a group of rebels sat around a small campfire heating pots of water for tea. Many wore ballistic vests and most carried assault rifles. Two burned trucks sat near the command post building. Nearly every house was damaged by shrapnel or bullets, and power lines, tree limbs and shards of glass lay strewn about on every road and yard in sight. Stacks of ammunition cases, food and other supplies made it seem as if the fighters are prepared for a prolonged stay. A commander called "Serge," wearing a helmet and an armored vest loaded with multiple rifle magazines, exchanged hugs with some comrades and told them of "really heavy" shelling at the airport Thursday. One shell went through three thick walls and killed a rebel soldier, he said. Nadezda Panasyk, 75, the only civilian seen who was not a member of the press, was not happy with the fighters' presence. She'd been living in the building they now use as a command post since the airport fighting began because, she said, she had no relatives and no place to go. Panasyk prayed quietly as sporadic shelling started hitting the neighborhood. In one hand she carried cut flowers and in the other a bag of apples from her neighbors' trees, which she'd been using for sustenance. She walked past a group of fighters, sat near a swing set, and cried. "All the houses are almost destroyed, what for?" she said. Panasyk said her father fought in three wars and died in World War II. "You're also destroying. You're also killing. Who are you protecting?" One replied: "We're protecting our Motherland." Sergey "Knas" Knazhyev, a gray-haired fighter with a Kalashnikov rifle and a friendly smile, said he joined the fight after his home in Maryanka was destroyed by Ukrainian artillery fire. Knazhyev said he joined the fight not for money, but for an idea: "to have peace here without shelling." When asked why the rebel forces don't lay down their arms and accept amnesty and Ukrainian rule, according to the terms of the cease-fire, his smile became a menacing glare. "It's not right when the Ukrainian government tells people where to live and where not," he said. "I don't go to Kiev and tell them where to live."